Hilarious the sense of humor that is sometimes inherent to things that just 'happen'. Funny how these currents run. I did not put it 'out there'. 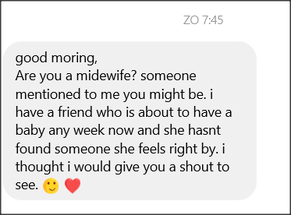 I left the Netherlands in the understanding that I was no longer going to practise midwifery. And still, the energy coordinator aka as God, my highest self, or source, shows me clearly that I am still sending out 'vibes'. Because it can not come into my world in any other way. I feel, (or maybe think, since it is in the area of my head) a pull towards saying 'yes' to this possibility of being with a birth again on the other side of the globe. This comes from a very strong sense of responsibility towards the human race. I am arrogant enough to know that I am her best option in a radius of hundreds of miles. And because this is the case, I have a responsibility to do this. Another thing simultaneously shining through is my ego, my comfort zone. It tells me that I will have found 'my place' instantly here. People will know me, I will have already proven myself. Easy as. Of course you should say yes! At the same time my stomach cramps together. Fear. Fear of again not having my life to myself. Of always being on call. You are just as on call for one person as you would be for many. Of making plans and having to change them. Of never being able to really relax, knowing I will have a chance to sleep at night and drink wine if I feel like it. A familiar cramp I thought I would never have again. My ego wins instantly. I shut out the cramp as if it was never there. Duty calls. And I answer her back. She happily brings her friend into the conversation the next day. I am so happy with dear, confrontational Majanka! She is a friend and college and knows this proces very well. She also knows me. Two times in a row she makes it clear that maybe this only happens because I need to choose. Or maybe this only happens so I can choose. I get the opportunity to make a conscious choice. Good on her that she wrote it twice in a short time frame, because one time I could ignore it. But two times, it lingered. In the mean time this pregnant woman is so happy she found me and wants to meet. Ai ai ai. I see now I had been too fast, ignored my guts (quite literally) and slid into an old path. I needed to sit down and meditate before continuing this conversation with her. I sat down. I opened myself to all possibilities. I asked; what is best for me? No answer came, only the feeling that all decisions were the right decisions. All depending on what I wanted to do with my life. I remembered what Daisha, the psychic lady, had told me in May. She said; you will always feel the urge to help people, whether you are a midwife or not. And your strenght lies in the therapeutic side of helping. Which is what I had noticed in the Netherlands; it was mainly therapeutic and hardly midwifery. Eric, who was doing his own things, had no opinion. He asked me questions to help me get some clarity for myself. 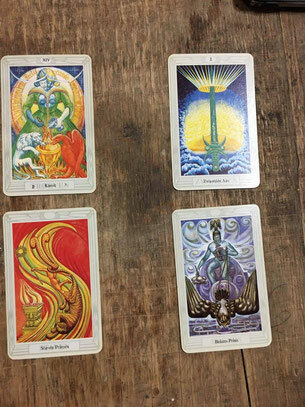 I decided to lay the tarot. This decision should not be made lightly. I had to be ok with whatever I would choose. And yes, I took my favourite tarotcards with me, the Aleister Crowley deck. Aleister was a dark person, an alchemist, conflicted with himself constantly, who worked with a very light woman. Lady Frida. She made the drawings. Together they made an intense deck which resonates with both my lighter and darker sides. The first lay I asked about the past and the future concerning my choice. The first cards were about the choice to stop practising midwifery, the second cards (underneath) were about the choice to continue and take this cliënt on. I pulled the temperence card for the past and the ace of swords for the future for if I would stop practising. The ace spoke to me of new beginnings. The second row had two cards that really didn't ring a bell. The future card felt vague. The past card shows me fighting, I think. I also took the book in my suitcase, but I didn't look up the meaning. I just wanted to be able to feel the cards. I decided to do another spread. I mixed it all again and decided to pull more cards, so I would understand better. The first row was about continuing to work as a midwife (no future or past, just what it would mean to me) and the second about stopping once and for all. The first thing I noticed was, that the second row had more 'light' to it. 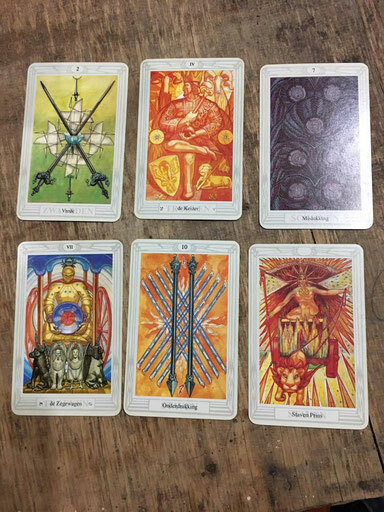 The first row was very clear to me; midwifery means security and balance for me (2 of swords) and it also means status and comfort zone (the Emperor). It makes it hard to change who I am and makes me rigid in a way (also the Emperor). The last card of the first row is very dark. I decided to look it up, but it actually means what it looks like; a warning. It talks about sadness and disappointment. The second row starts of with the Chariot, which means that you will find a way and win, all conflicts ending in victory, etc. The middle card shows me that it will feel like I have to supress inner powers to stop practising , the last card shows me that it will feel like I have my life back in my own hands. And that I will burst with creativity and focus. I think it shows me clearly where I want to be. I wrote the woman back and apologized. I offered to talk about everything and help to give her a good, strong basis on which to make further decisions. But I was not going to be at her birth. Still I felt insecure within myself. I've never made a choice like this before. Right before I fell asleep last night, I wrote Lune a message. I know Lune to be very intuitive and she has seen me stumble and rise on my path these last years, so she knows where I am at. Sometimes better then I do myself. When I woke up in the morning, her answer was visible in whatsapp. She reminded me of the fact that I actually did not believe that women should have someone with their birth. It is true: I believe it keeps them from what their true experience would be. She also reminded me that I bring that message across very clearly and through this, make women feel very confident in their own ability and in making their own choices. And that this strenght would still be great to use. She also wrote that I look so different on the pictures I post now. I look so relaxed and happy since I quit. Thank you Lune. Thank you Majanka. Thank you Eric. Thank you to whoever it was that put out there a midwife was in town and give me the opportunity to make a conscious choice.